Planning a party? Sacramento Party Jumps has all your Concession Rentals covered! Our Mr. Frank Hot Dog warmer and bun steamer is a delicious and sanitary way to serve hot dogs to your guests without having to stand over a hot grill. Hot dogs are an easy and fun way to keep your party full and enjoying the party. We also have a Spin Art Machine rental that is sure to provide fun for your little artists. Kids and adults will enjoy making art work to take home with them! 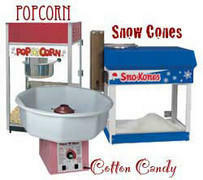 Check out our cotton candy machine! The nostalgic smell and taste of cotton candy will bring a smile to everyone's face. And if your looking to cool everyone down; we've got a Sno Cone machine that will do the trick! Concession Rentals can be the star of any event or you can add them to any other rentals with Sacramento Party Jumps. Check out our Obstacle Course for a fun attraction for your next party!